One thing some audio enthusiasts overlook is the level of importance the enclosure of the speaker has on sound quality. This uses a top of the line wooden enclosure, which is one of the reasons the sound quality is so crisp. Other brands use particleboard, which is not as dense as the high quality MDF wood we use. This item has two 10” woofers with 1.5” KSV voice coils and 25 Oz magnets that provides really clean sounding bass. The 2 tweeters provide great sounding highs. One of the reasons our speaker sounds so good is due to the amplifier. Our engineers spent extra time and money on the built-in amplifier and properly matched the power handling. A speaker can only go as loud as the amplifier powering it. We invested into the proper enclosure, proper amplifier, and then matched the proper speaker components with the enclosure and amp. 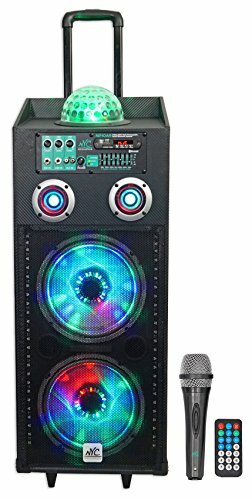 NYC Acoustics N210AR dual 10" 2-Way 600 Watt Rechargeable Active Speaker With Built In Bluetooth, MP3 display, USB, SD. Perfect for house party’s, Home use, DJ, tailgating, camping, and many other applications. 600 Watts Peak Power. 300 Watts RMS Power. (2) High power long-throw 10" woofers with 1.5" KSV voice coils. 12V 7 AH rechargeable battery. Rechargeable battery lasts for 6–7 hours on low volume, 5–6 hours on medium volume, and 4–5 hours on high volume. Includes: remote, power cable, wired microphone, 10 Foot Mic Cable. Built In Wireless Bluetooth Supports Music Streaming Through a Bluetooth Phone or MP3 Player. 49 foot Bluetooth range. USB/SD digital MP3 music player. Built in FM radio. ¼" mic input with level control. ¼" line input with level control. RCA Aux Input with level control. Master volume control. Built-in wheels and retractable trolley handle for increased portability and transport convenience. 7 band graphic equalizer built in. Magic ball on top transmits a disco dance light effect in the room. LED flashing lights on woofer and tweeters. LED screen displays audio information when using Bluetooth or SD/USB player. Boosting and cutting specific frequencies to improve sound quality and clarity. Frequency Response: 40Hz–20KHz. Maximum SPL @1w/1m: 105dB peak / 100dB continuous. Speaker dimensions in inches: WxDxH 11.82" x 9.84" x 30.03". Packaged dimensions in inches: WxDxH 13.42" x 12.20" x 33.10". Net weight: 45lbs.